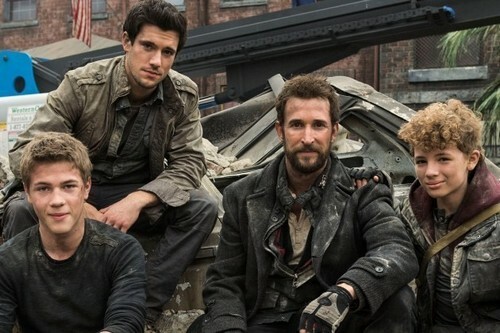 Falling Skies returns tonight on TNT with a new episode at 9PM EST called “Mind Wars”. On tonight’s episode, Tom encounters two enigmatic strangers, who attack his family, then lead him on a violent odyssey. On the last episode after breaking out of the Espheni Ghetto, Tom and the 2nd Mass sought refuge in a Volm hideout, where tensions ran high between the Volm and humans. Tom set off with Weaver and Cochise to find Matt, leaving Hal in charge. Meanwhile in Chinatown, Anne was reunited with Lexi, and came to realize that the little girl she saw 6 months ago was now a grown woman. Did you watch the last episode? If you missed the episode we have a full and detailed recap, right here for you. On tonight’s episode Tom encounters two enigmatic strangers, who attack his family, then lead him on a violent odyssey. Meanwhile, Hal tries to find a safe place for the remaining Volm and 2nd Mass; and Lexi and Anne clash, triggering perilous consequences. Tonight’s fifth episode of season four of Falling Skies is going to be great. You’re not going to want to miss a minute of the action and we’ll be recapping it live for you as well. While you’re waiting for the episode to begin hit up the comments and tell us your thoughts about the show. Tom encounters mysterious strangers in the woods; Hal tries to lead the remaining Volm and 2nd Mass to a place of safety; Lexi and Anne have a difference of opinions. Tonight’s episode begins with Matt, Tom, Weaver and Cochise arriving back to where they last left Hal and the group but they soon find no one is there. Hal’s group had to leave to get away from the patrols. Tom learns of the sanctuary in Chinatown. Tom talks with Scorch and Scorch assures him that he is personally overseeing this search and he WILL meet back up with him, trying to give him more reassurance. Hal reviews the map and continues leading the refugees but has to come up with a plan as a mech is patrolling the area. He has established his own group that includes Tector, Dingaan, and Pope. He also has Shaq to rely on as well. As he and Pope discuss a plan, Pope is his usual self and sarcastically says “I left my crystal ball back in the magical land of Oz.” Hal works his plan with the help of Tector and Dingaan who are holding a rope in place to stop a mech in its tracks Pope and Sara hop in a truck and rush at full speed towards the mech taking him down, allowing Shaq to go in and pull out the core. Sara gets a rush from the whole incident and cheers, “We crushed that thing like a cheap beer can!” They use the core to hack into the Espheni communication system and determine where the patrols are. Two strangers that Tom, Matt, and Weaver encounter seem to be nice as they invite Tom over for food and shelter. They sit around the campfire talking about the ghosts for hours when Tom, Matt and Weaver get up to leave. They were deceived by the men, as they later find out, as the men they try to kill Weaver and Matt while taking Tom hostage. Later, we see Matt and Weaver working together to try to save Tom. Weaver tells him, “You are a Mason!” as he is encouraging him to be brave in defending his family. Weaver tries to talk Matt through killing Tom’s captor since he has a good shot, and while he is very willing and anxious at first, he puts down the gun and tells Weaver, “I can’t do it.” He then starts crying and Weaver comforts him. Weaver then takes control. Things get tense with Tom and his captor but just then the man is shot and Weaver walks up from behind as we see Tom very relieved.